It seems that my article last week on the dangers posed by birds struck a chord with the readers, many of whom posted their own stories of terror at the hand of this avian menace. I particularly enjoyed the story involving the Satyr Tragophan, not because I enjoy painful stories of high medical bills so much as if you are going to come a cropper of a bird it may as well be a good looking one (as with birding with life in general really). One commenter actually said their were rooting for the birds, and, well, no offence but I’m not sure I want to go birding with you. In the event I’m in a life or death struggle with an Oregon Junco or a particularly feral Dunnock I’d rather my birding companion was at least nominally on my side. At any rate it seems fair to say from this completely anecdotal and unscientific survey that birds are more dangerous that even I initially supposed. So I thought I could give fair warning about one of the more dangerous birds out there, even more dangerous than the Lesser Goldfinch, and one of the more common and familiar birds of Australia and New Zealand, the Australian Magpie. Australian Magpie! Dum dum DUM! 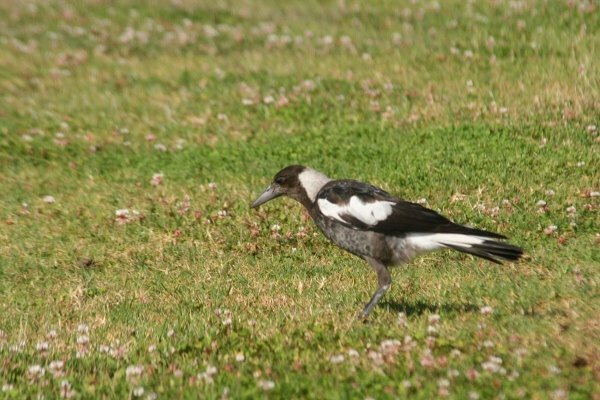 The Australian Magpie is not actually a magpie, a fairly common state of affairs for birds from the colonies. It’s actually a member of the family Artamidae, which includes the woodswallows (not actually swallows), the butcherbirds (not actually shrikes) and the peltops (which actually are peltops, since there are no others). The family recently was linked to the vangas of Madagascar, but it would be silly to read to much into this as they will soon be linked with storks or sunbitterns or something (the family was recently lumped together with the woodswallows and will probably be split again soon, then re-lumped and merged with the white-eyes, terror-birds and fruit flies). Australian Magpies are found across Australia, southern New Guinea and have been introduced to New Zealand (along with just about everything else). They have a very melodious and odd call which is highly distinctive and evocative of the Australian bush. 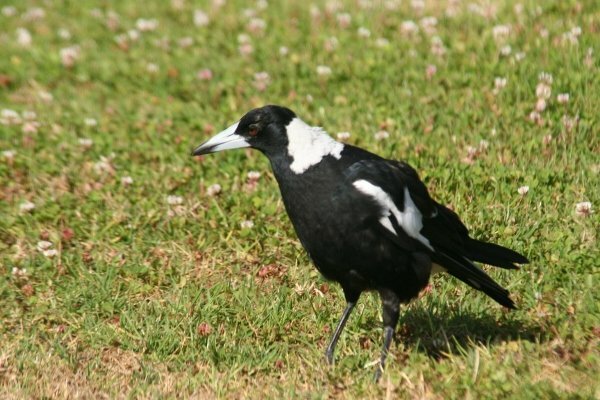 Australian Magpies, like every other animal in Australia, are also dangerous. Not in a “har-har that bunny is dangerous” kind of way, in an actual “this bird will mess you up” kind of way. No, you see, the males are pretty defensive about their young, and in the breeding season will aggressively attack what they perceive as a threat to their nest. This, unfortunately, can include pedestrians walking down the road, or cyclists. The attacks start with swoop from behind, and then closer swooping followed by biting and pecking. In extreme cases it can end up with the bird flying at the face or chest, gripping with it’s claws and biting anything it can. The attacks are all the more confusing for their seeming random selectiveness. Some birds attack all kinds of targets, some only pedestrians, some only cyclists, some only mailmen! Some birds seem to specifically have it in for certain people; I once knew one that had it in for me. It’s an unnerving experience and not at all pleasant even if the bird doesn’t connect often, and I am no stranger to bird attacks. A young bird contemplates a future of attacking humans in a funny field. It is also worth clarifying that these attacks are not a “nuisance”. People go to hospital suffering from eye injuries and falls from bikes. On average in Brisbane between 4 to 13 need treatment for eye injuries each year – extrapolate that across the country and you have a legitimate cause for concern, especially when the victims are often children. Australians, being on the whole indisposed to whining, have dealt with the problem in a variety of ways. Bicycle helmets often sprout antennae during the breeding season, or poles mounted on the back of the bike. Signs are posted warning of particularly aggressive birds in parks. Sometimes nests are destroyed or even pairs are shot, but the highly individual nature of the species has actually led to improvements here as well. Scientists have found that as it is only the male that is a problem, and not all males, it is preferable to simply catch the problem males and relocate them away from people. The females quickly pair off again with a new male who usually has a more relaxed attitude to the odd moving kangaroos in his patch. Can’t wait to visit Australia! Maybe an Australian remake of Hitchcocks The Birds is on the cards, it sounds like the Aussie Magpie is more scary (and realistic) then the birds featured in the original. My boyfriend’s Colorado family told us that their Black-billed Magpies are also particularly cruel: allegedly, when snowstorms hit the mountains and lambs get stuck in the drifts, the magpies swoop in and pluck out their eyes. Hard to believe of such a pretty bird, but Jordan’s uncle was seething as he told us about it. I got attacked by a bird when I was in Australia but it wasn’t a magpie. It was a Noisy Miner. Should We Take the “Christmas” out of the Christmas Bird Count?